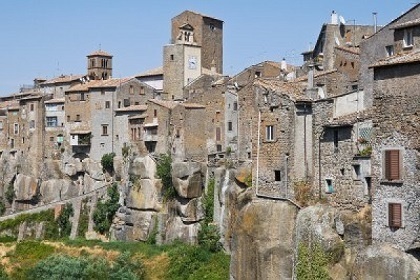 Vitorchiano, located in the province of Viterbo is a very picturesque village, perched, as usual in this area, above a tufaceous crop. It is surrounded by rolling green hills covered with hazelnut trees (the area produces some of the best Italian hazelnuts classified as DOP), vineyards, olive groves, woods of oak and chestnuts. Its origins seem to date back to Etruscan times, but the city was also inhabited in Roman times and has always been extremely devoted to Rome, to the point of putting on their heraldic logo the S.P.Q.R. letters, symbol of the acronym `The Senate and the People of Rome`. Within the walls the village retains the typical medieval architecture with the characteristic towers, the cobbled streets and the cosy squares. Once entered through the Porta Romana (the main door named this way because it faces south, towards Rome), the best way to explore the village is just by wandering around, walking along Via Arringa to Piazza Roma, stopping to have a look at the Town Hall and the Clock Tower and maybe having in one of the various lovely restaurants. After lunch, though, you should definitely take your time to walk a bit further, through Porta Tiberina, to reach the charming hermitage dedicated to San Michele Arcangelo form where you can also enjoy a beautiful view of the village. Last but not least, while in Vitorchiano you should definitely pay a visit to the Trappist Monastery and buy some of their super-delicious jam. Vitorchiano is less than a hour drive from Capena but if you decide to take a longer tour, you can couple the visit with a stop by the Vico lake.